Click here to add a Gift Card to your order. Alli has created a unique and fun line of earrings. Perfect for everyday wear. 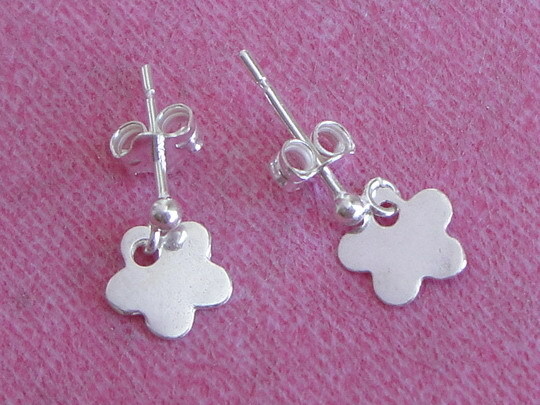 These earrings are all made from .925 sterling silver. Note: For some of the products, the Bradley hand font is also available, if interested in this option, please enquire with Alli. 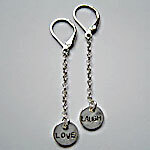 • These double loop earrings have a mini rectangle tag dangling from the top. • You can personalize this tag with up to 4 letters or a symbol. • Symbols available for this piece include: A squiggle (as seen in the photo), flower, heart or star. • A small disc dangling from a loop. • This disc can be personalized with up to 5 letters or a symbol. 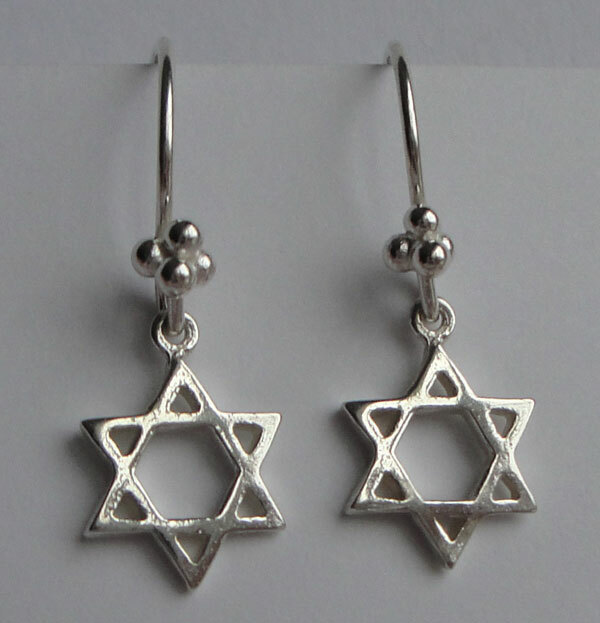 • Symbols available for these earrings include: heart, star, star of David, flower or apple. 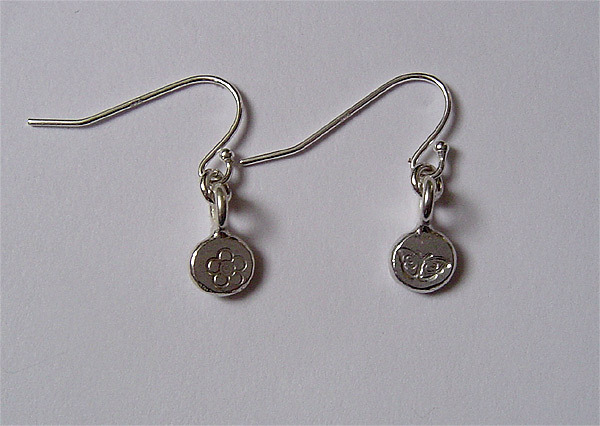 • These earrings include a small disc that dangle from the end of a fine silver chain. • These earrings are approximately 33mm in length but can be lengthened to shoulder dusters for $10 extra. 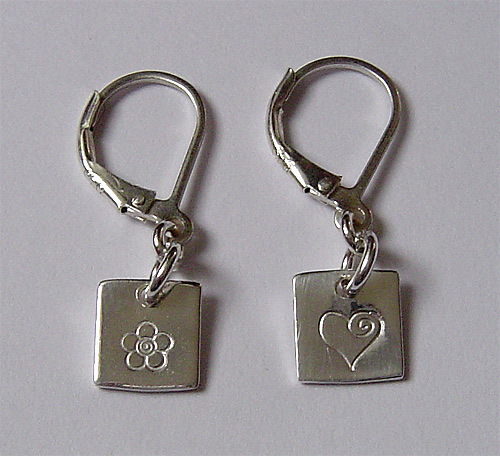 • These earrings include a mini tag dangling from a fine silver chain. • Symbols available for this piece include: A squiggle, flower, heart or star. • These earrings measure approx. 21mm in length. 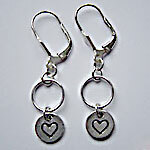 • These earrings include a small heart charm that can be stamped with up to 4 letters or an initial. 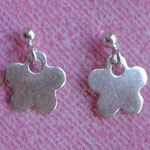 • These charms also look great plain, without any stamping. 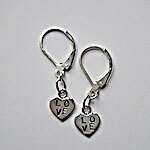 • These sweet earrings are made from .925 sterling silver. 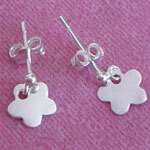 • The daisies measure 8mm and dangle from a simple silver post. • Each daisy can fit a single initial or a tiny heart, star or flower symbol. They are also adorable left blank. • These sterling silver earrings can be customized with up to 5 upper case letters or 6 lower case letters, an initial or a symbol of choice. • These sterling silver earrings can be customized with up to 2 lines vertically with a maximum of 8 letters per line. • Or if you would like them stamped as it shows, these tags fit up to 5 bradley hand font letters, 9 lower case comic font letters or 7 upper case block letters. • A tiny heart or tiny star stamp may also be added and counts as one character..
• These sterling silver earrings can be customized with an initial or a symbol of choice. 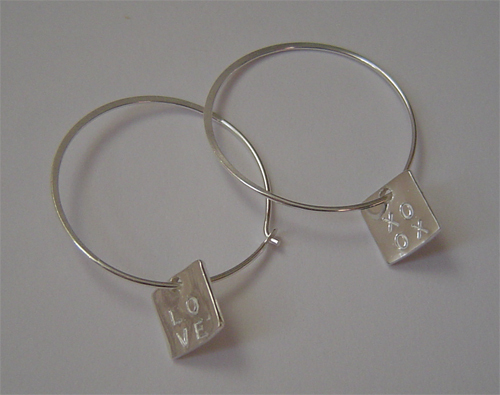 These sterling silver hoop earrings each have a custom, hand stamped square tag dangling from it. The tag can be stamped with up to 5 upper case letters, 6 lower case letters or a symbol of choice. 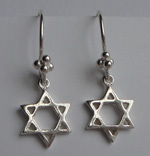 These earrings are made from .925 sterling silver. The rectangle bars measure 18mm long. 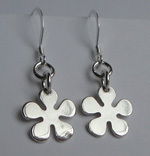 These earrings are made from .925 sterling silver. The Hamsa measures 12mm long. 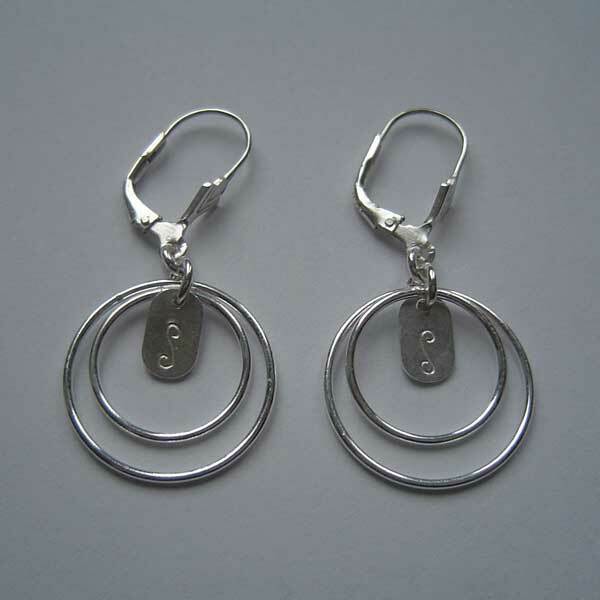 These earrings are made from .925 sterling silver. The Stars measure 10mm. 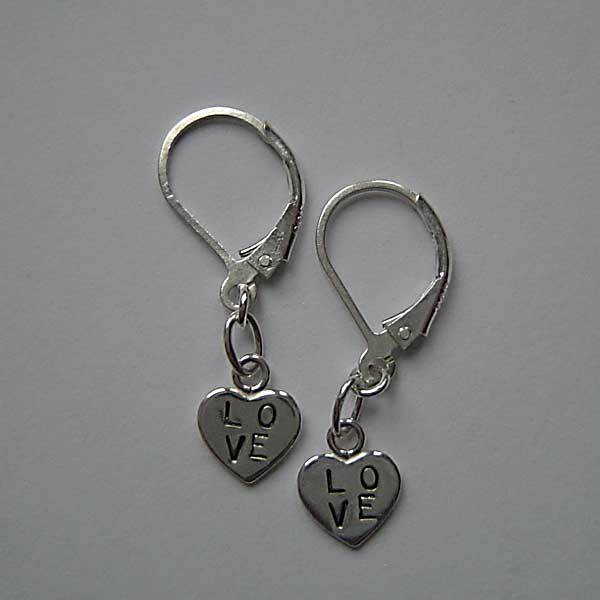 These earrings are made from .925 sterling silver. The discs measure 13mm. 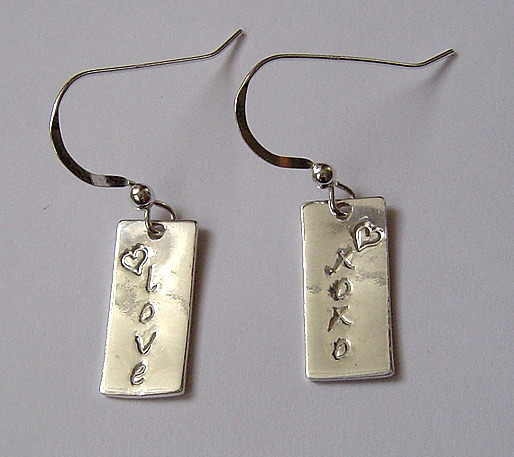 These earrings are made from .925 sterling silver. The discs measure 11mm. These earrings are made from .925 sterling silver. The peace sign charms measure 9mm. 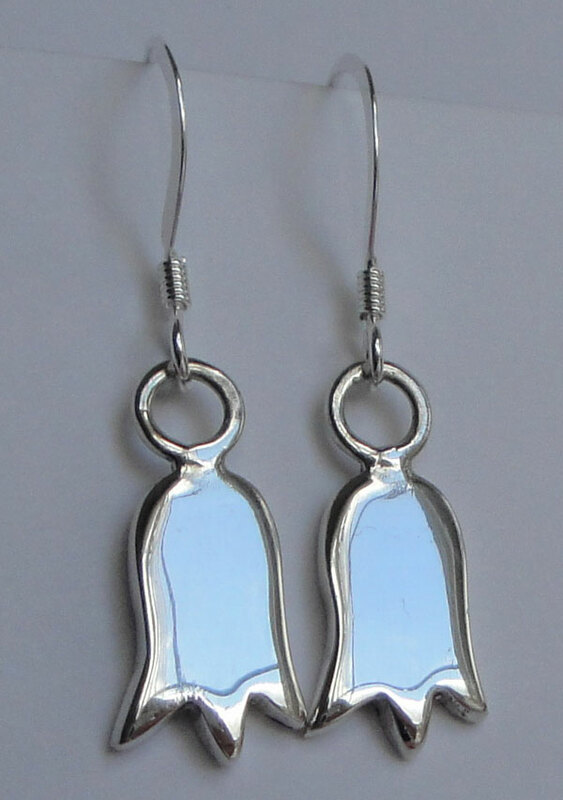 These earrings are made from .925 sterling silver. 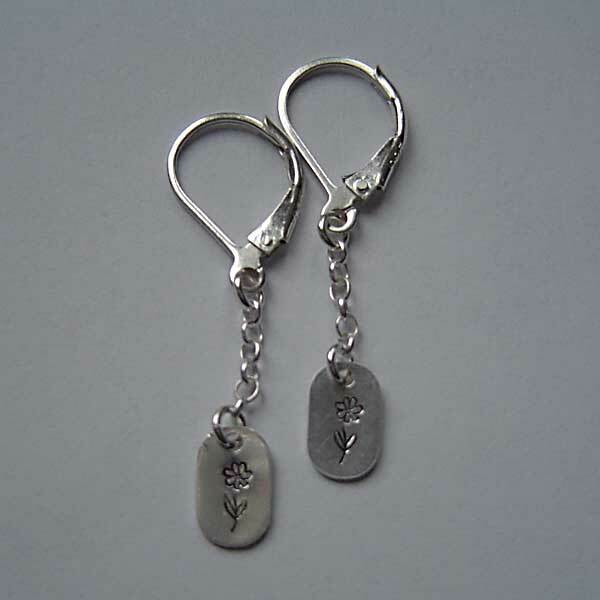 The lotus flowers measure 11mm. 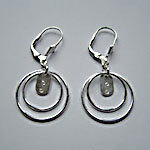 • These earrings are made from .925 sterling silver. The Tulip charms measure 7mm x 18mm. 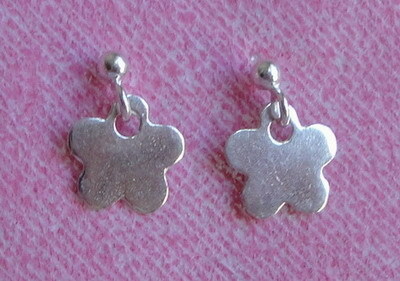 These earrings are made from .925 sterling silver. The hearts measure 11mm. These earrings are made from .925 sterling silver. The tags measure 7mm x 9mm.